I have always been intrigued with Basque food. 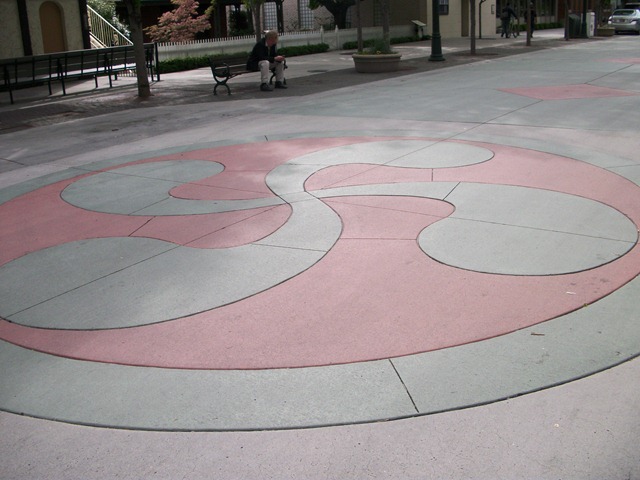 And lucky for me, Boise has quite a large Basque influence making it easy to indulge in it whenever I want. But the question always come to mind, how can one make such delicious tasting food at home? As a fairly belated birthday gift to my bestie, I treated her to a Paella & Sangria Cooking class at The Basque Market last night. 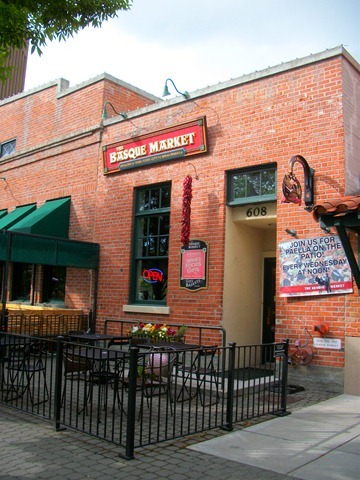 The Basque Market sits in the middle of the Basque Block in downtown Boise. 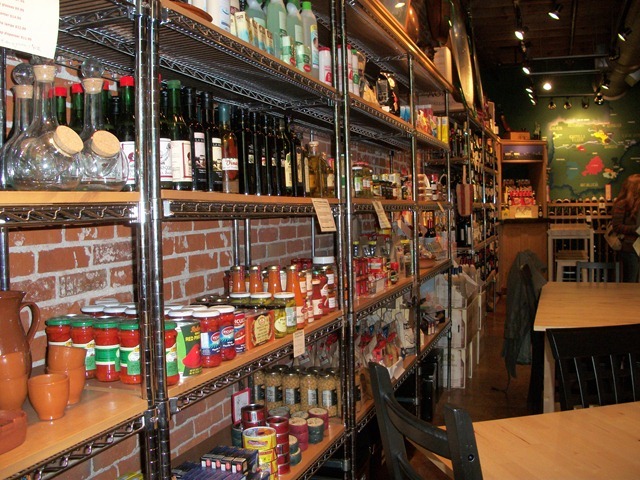 It’s a great little place to snag a delicious bottle of wine, fresh meats & cheeses, or even pre-made croquettes. (If you’ve never had a croquette, you are truly missing out). We were anxious and excited to finally take this cooking class. Her birthday was in January, so this has been a long time coming. 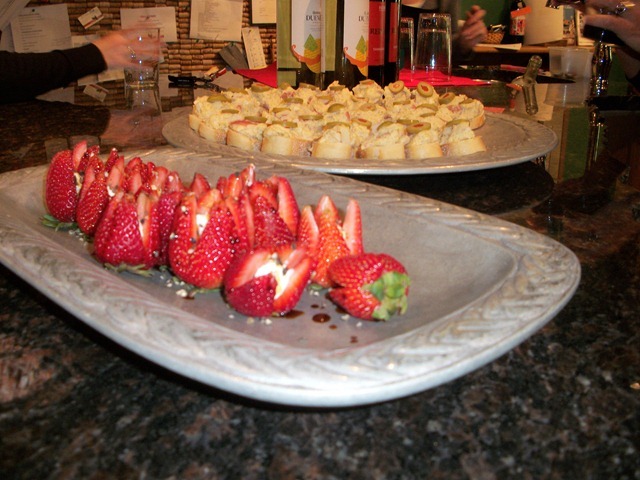 Included in the price of the cooking class ($30/person) was a tasting of several Basque wines, tapas, a full plate of paella, and Sangria! 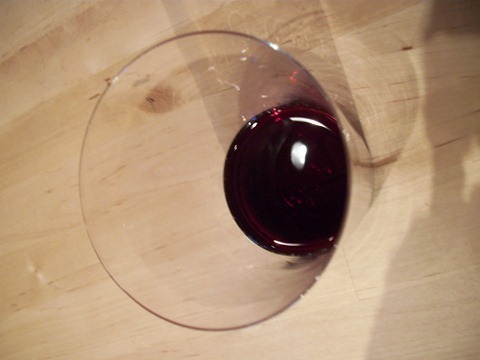 The evening began with a nice glass of Tempranillo wine as we mingled and looked around at all the fun Basque foods and paella making supplies inside the market. .
Then we watched as they brought out a few tapas for us to taste. The strawberries were stuffed with goat cheese and sprinkled with ground pepper, and topped with a pomegranate molasses. Holy yum! The second plate, was actually a piece of toasted baguette topped with potato salad and a green olive. It was actually quite good despite the sound of it. Next up it was time to talk about & cook Paella! 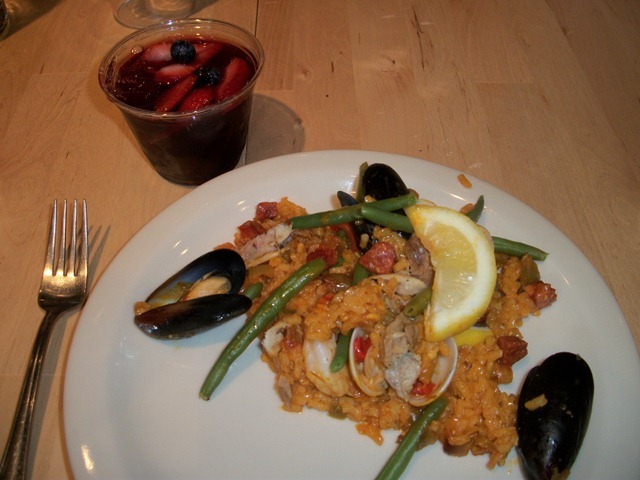 Paella can be described as very popular rice dish originating from Spain. 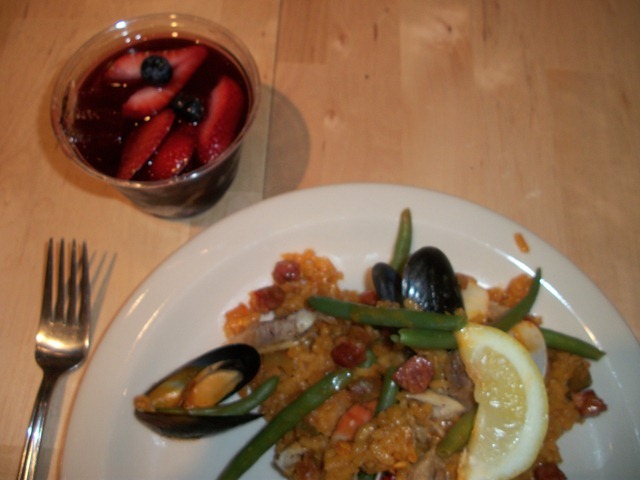 Paella may contain rice, fish, chicken, pork, shrimp and chorizo. Also saffron is an essential part of the dish, turning it it’s signature golden color. They talked about the order of cooking the different ingredients, and how to cook the dish. It is actually a very similar cooking method to that of making risotto. 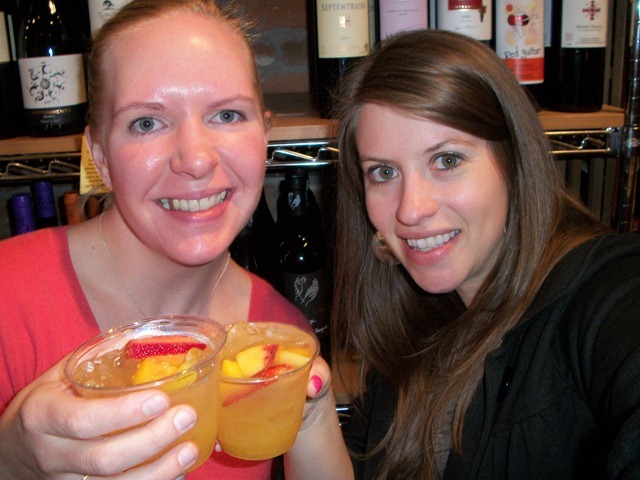 While the Paella cooked we made some Sangria! You can use either Red or White wine to make your Sangria. And it is so easy to make! 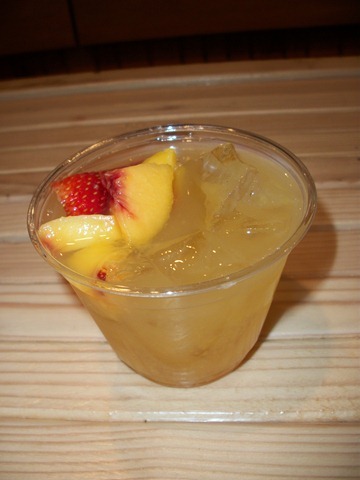 Take a bottle of white wine, mix into a pitcher with 1 cup Brandy, 1 cup simple syrup (2 cups sugar & 2 cups water boiled until sugar dissolves), and 1/2 cup fresh orange juice. 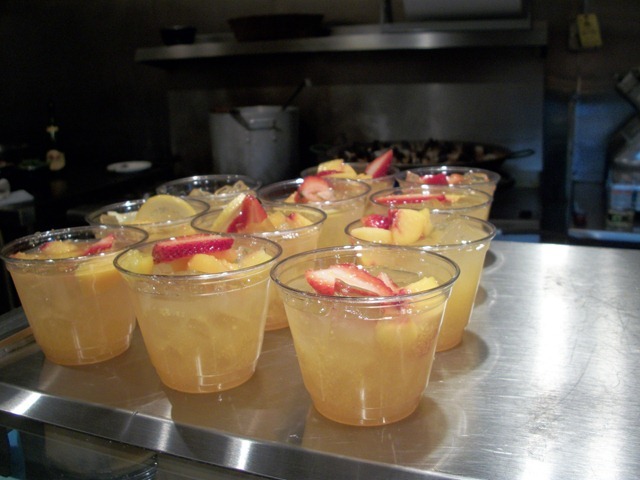 Mix well, then add 1 cup of assorted sliced fruit (limes, oranges, mango, strawberries etc) to pitcher right before serving. Then it was time to give the Paella a try! 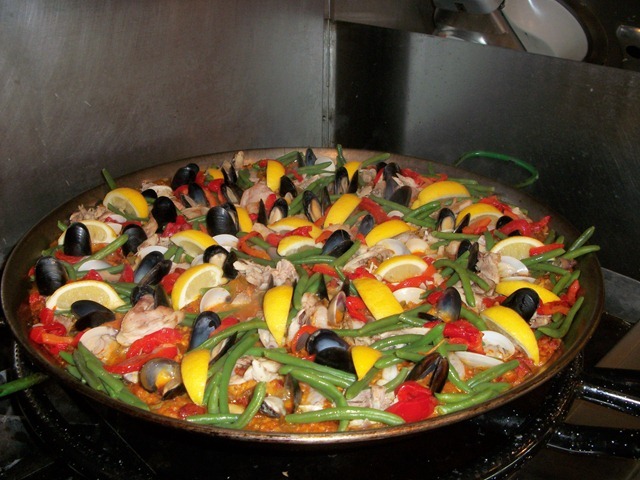 Our Paella included, chicken, mussels, clams, chorizo, green beans…There really is no wrong Paella combination! And of course, I had to pair it with the Red Sangria, because I needed to really have the full taste experience, ya know?! I loved taking this cooking class because I learned a lot. 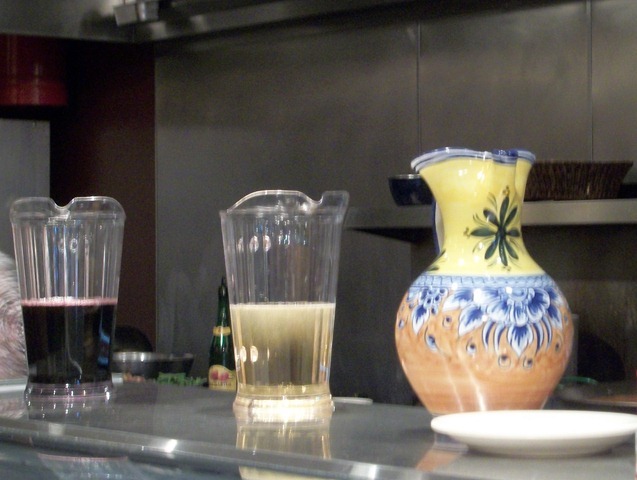 We learned about the history of the dish and how to make it as well as how to prepare two different types of Sangria. Cooking class success! Have you ever taken a cooking class? This entry was posted in Uncategorized by The Linz. Bookmark the permalink. What a GREAT gift idea! 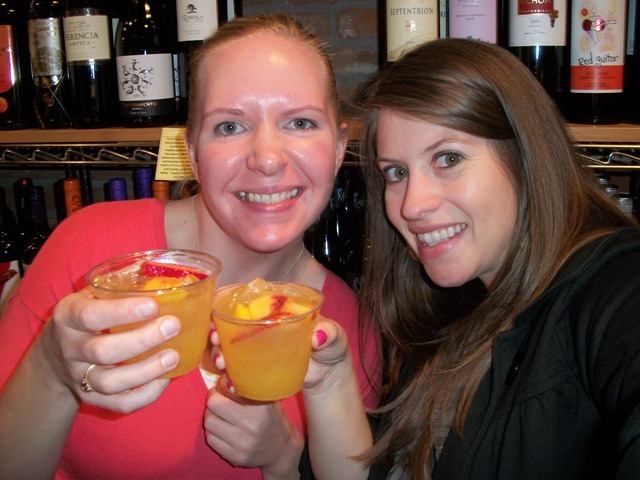 You get to have some drinks and good foods, learn how to make them AND have a fun evening out with your girl! Everything looks tasty… except for the seafood aspect. 😉 I NEED to make those strawbs! ive never taken a cooking class but the bf and I talk about it all the time. its such a fun activity! I LOVE this post! SO FUN! And that sangria sounds soooooo good. Mmmmmm. I’m starring this post so I can come back to this recipe. Oh my gosh, that food looks SO delicious! What a fun class and a unique gift for your best friend! I’ve never taken a cooking class, but if they offered something like that in Minneapolis, I’d definitely sign up! I don’t like paella because most of the times it has seafood in it which I don’t eat. But if that’s not in it and just chicken I eat it. I’ve had several food classes and I really love it. 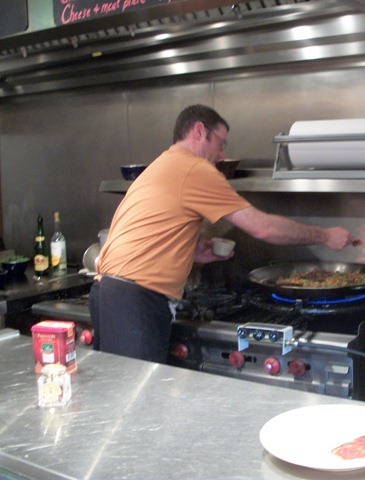 Did you get the recipe for the paella after the class?